Bake potatoes for 1 hour at 400. Allow them to cool to almost room temperature, then slice lengthwise and scoop out the insides, reserving 2 potatoes' worth of skins. Reduce oven to 350. 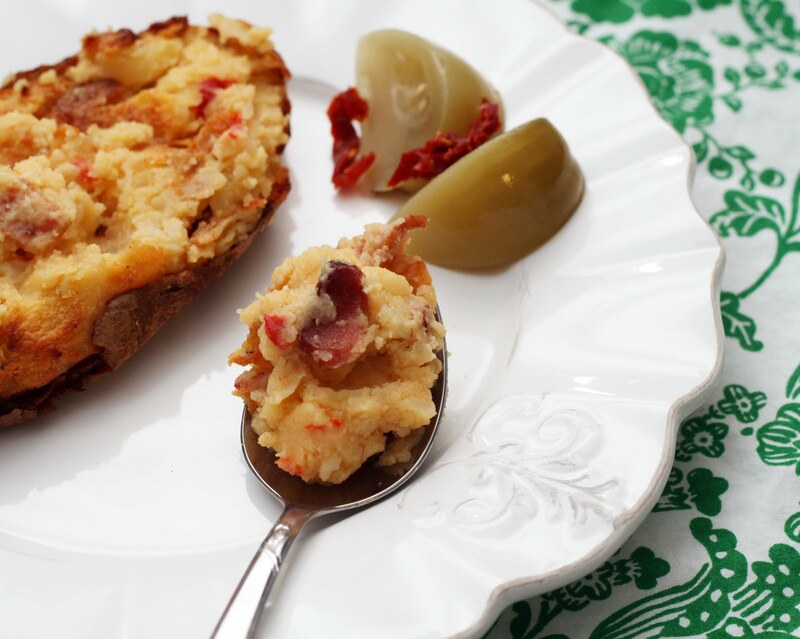 Place the pimento cheese, and potato into a medium bowl. Mash until smooth then fold in the bacon. Refill the potato skins and place on a baking dish. Bake 10 minutes or until warmed through. Serve immediately. Heat oven to 350°F. 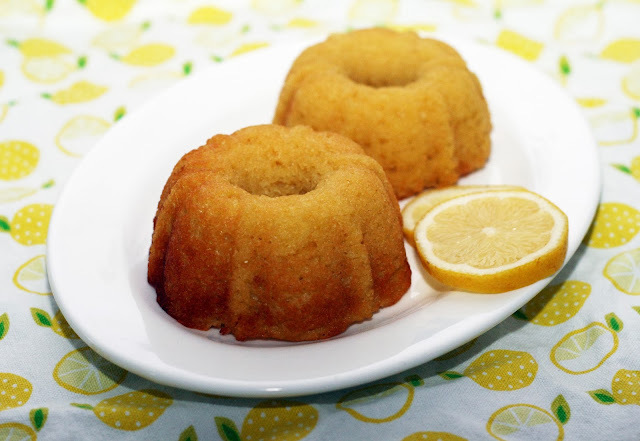 Generously grease 8 fluted tube muffin cups (mini bundt pan) with cooking spray or shortening. In medium bowl, stir together flour, sugar,baking powder, baking soda and salt; set aside. In large bowl, beat remaining ingredients with whisk until well blended. Gradually beat in flour mixture until well combined and batter is fluffy. Divide batter evenly among fluted muffin cups. Bake 15 minutes or until toothpick inserted in center of cake comes out clean. Cool in pan 2 minutes. Place cooling rack upside down over muffin pan. Turn rack and pan over; remove pan. Cool completely, about 1 hour. These little Bundts are lighter than your average cake thanks to a generous amount of yogurt, which also adds a lovely flavor. The perfect addition to the dessert table. Toss the beef with the salt, pepper and some super fine flour to coat. Set aside. Heat some olive oil in a Dutch oven and add the beef, carrots, potatoes, and mushrooms. Saute until the beef is lightly browned on all sides and the vegetables are just beginning to soften. Pour the mixture into a 4 or 6 quart slow cooker. Add the stock, tomatoes, thyme and bay leaf. Cover and cook on low for 6-8 hours. 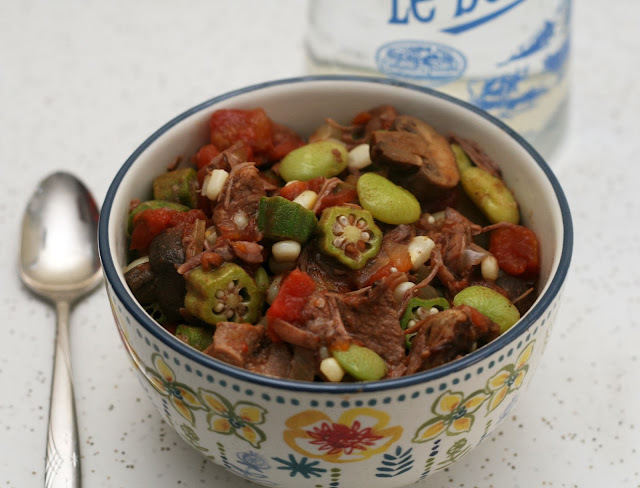 Stir in the okra, corn, and lima beans. Cook for an additional 1-2 hours. 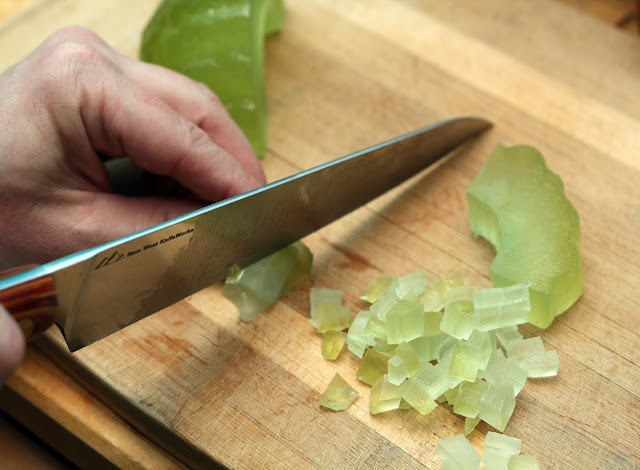 Remove the bay leaf prior to serving. Stir. Garnish with parsley. Making stew always makes me think of my Grandpop. He'd make stew with beef and anything that caught his fancy. Some weeks it would have tomatoes, some times green beans, all sorts of things. The best part was that when I'd come home from school, the whole house smelled like it even though he lived in an in-law apartment and made it in his own separate kitchen. He'd serve me some as an afterschool snack. Now it is my job to make stew, and I like to make it into the slow cooker versus the stove top because it makes my house smell great all day. The beef gets super tender too. The problem with slow cooker beef stew is that some times it becomes a big pot of blah. I avoid this by stirring in fresh and/or frozen vegetables towards the end of the cooking period for a burst of fresh flavor. The result is just as comforting but has a lot more punch. I took a similar approach as my Grandpop and added a hodgepodge of my favorite ingredients to make a wonderful tasting, satisfying, Southern-inspired stew. Preheat oven to 350. Butter or spray (with cooking spray with flour) a 9-10 inch springform pan. Arrange persimmon slices on the bottom of the pan. Set aside. In a small saucepan, melt and stir together butter, brown sugar, and cognac. Cook over low heat about 5 minutes or until it thickens slightly. Stir thoroughly to combine. Pour over the persimmons. Set aside. Cream together the softened butter and sugar in a large bowl. Add the eggs and beat until fluffy. Whisk together the spices, baking powder and flour in a medium bowl. Whisk together the persimmon puree and cognac. Add the dry ingredients alternately with the persimmon mixture beginning and ending with the dry ingredients. Pour into the persimmon and caramel laden cake pan and bake 35-45 minutes or until a toothpick inserted in the center comes out clean. Allow to cool in pan 5 minutes then carefully invert onto a plate. Cool completely, on the plate, over a wire rack. I love upside down cakes because while I love cake (and icing!) I hate how making a traditional frosted cake can be so time consuming. I don't mind for a special occasion but for every day, I don't always want to go through the hassle of making the cake layers, waiting for them to cool completely, then making icing and frosting them. Oy. But upside down cakes are perfect! They are only one single (small) layer and don't need frosting because they are covered in delicious caramel and fruit. Perfect for when you have a hankering for cake but not the time. Which isn't to say upside down cakes aren't perfect for a festive occasion as well; they are impressive looking and a real crowd pleasure. 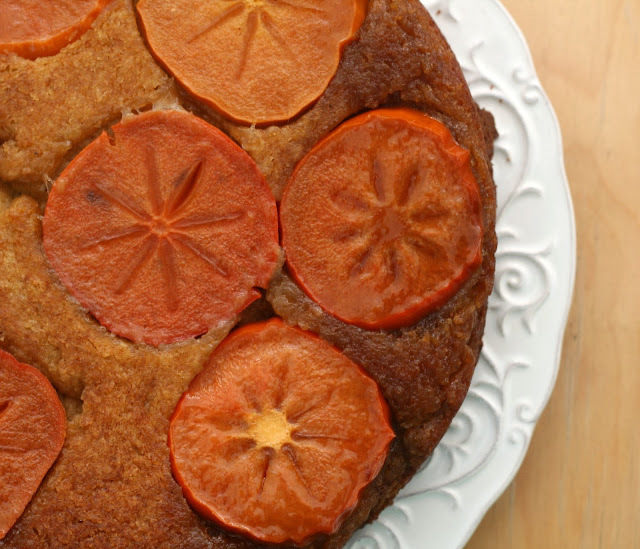 This one married the flavors of persimmon, cognac and allspice which makes for a cake that really tastes like the best of winter. How good would it be with some mulled cider? Heat a bit of oil or bacon fat in a large skillet. Saute the onion, garlic and mustard seed until the onions are softened and translucent. 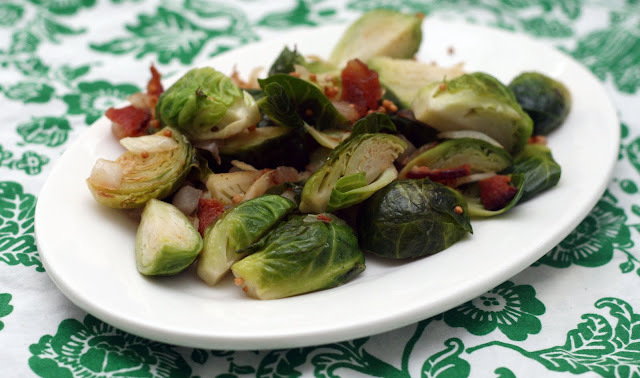 Add the Brussels sprouts and saute until soft and the cut sides are slightly browned. Sprinkle with bacon, salt and pepper. I love mustard seeds! I always have a ton of them on hand because I like to be able to make pickles at the drop of a hat but they are great in other dishes as well. I like how they pop in your mouth and give dish a dash of mustard-y flavor without having to make a dressing. They stand up to robust tasting ingredients like Brussels sprouts and bacon; a rare quality in a spice unless you really pile it on. 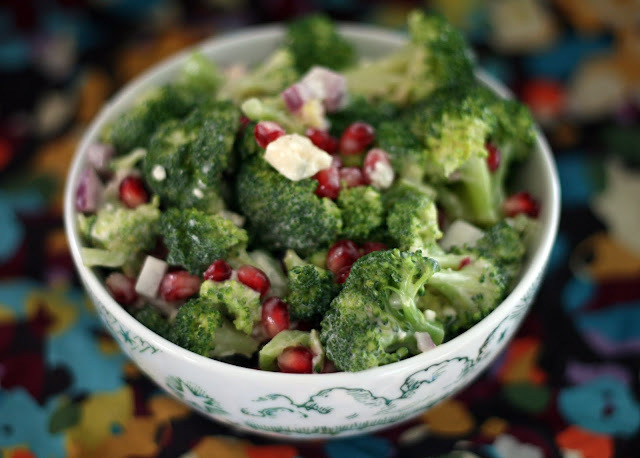 The perfect quick and easy side dish for a holiday or every day meal. Place all ingredients in a food processor. Pulse until nearly smooth. Refrigerate at least 1 hour prior to serving. It is that time of year again. No not Christmas! Ham season! Hams seem to go on sale twice a year, in December and again around Easter. I pretty much only buy whole hams then because they are so big, heavy and expensive the rest of the year. I turned this ham into sandwiches, stuffing and this zesty spread. 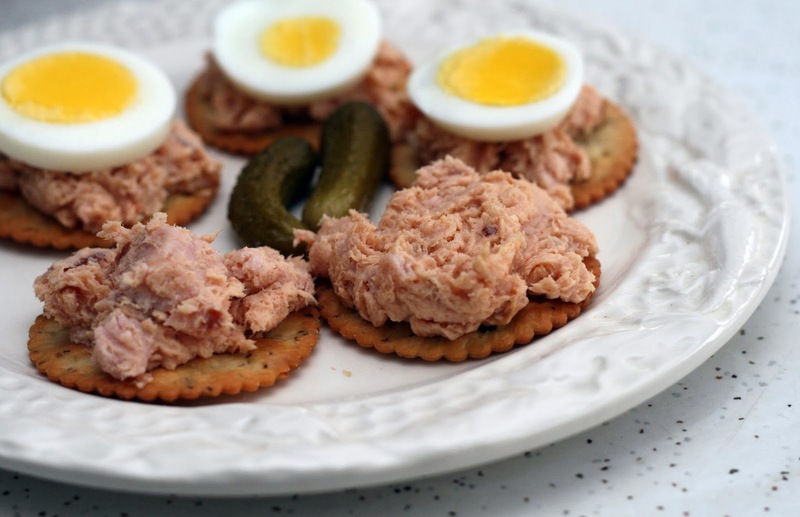 Normally one only finds deviled ham in cans (ugh) but freshly made deviled ham is a delight, it similar to ham salad but smoother and a bit spicier. I like it on crackers or if I am feeling decadent in a deviled ham-grilled cheese sandwich. A worthy use of leftover holiday ham. 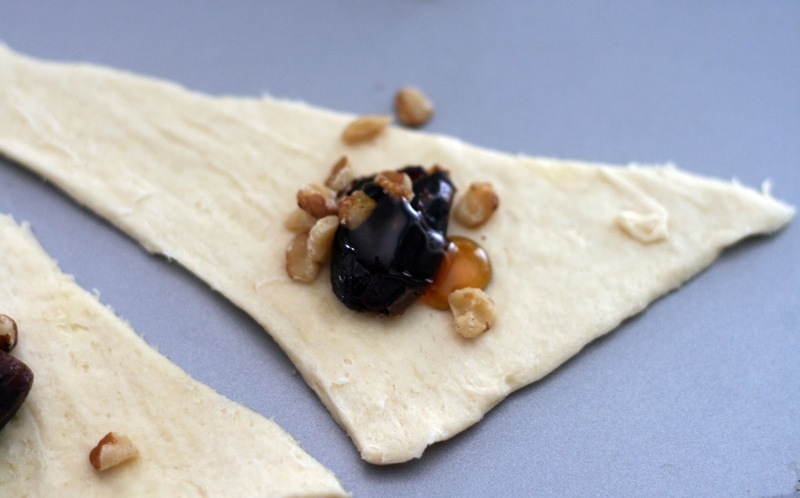 Remove the dough from package, separate into 8 triangles. Place triangles on ungreased large cookie sheet. Place a date in the center of the widest part of each triangle. Sprinkle the date with walnuts. Drizzle the date and walnuts with honey. Pull the short point of the triangle, stretching it slightly, towards the other point to form a smaller triangle. Pinch edges to seal. In a small bowl, beat together egg and water. Brush top of each rectangle with egg mixture. Sprinkle with sesame seeds. Bake for 10-12 minutes or until golden brown. Pillsbury asked me to come up with one more recipe using their crescent rolls. I came up with this easy recipes inspired buy honey date walnut cake. Perfect for breakfast, tea time or even dessert. Prep your jars/lids. Place all ingredients in blender. Pulse until smooth. Pour into a small sauce pan. Bring to a rolling boil and cook until thickened to ketchup consistency, about 20 minutes. Ladle into pint jars leaving 1/4 inch headroom. Process in a hot water bath for 10 minutes. Note: If you do not wish to can, simply ladle into an air-tight container. Refrigerate up to one month. This is really small batch canning. I had some pineapple leftover from another recipe and I already had the water boiling for another canning project so I thought I'd make a tiny batch of tropical tasting ketchup. It was even easier to make than my earlier ketchups because I started with crushed pineapple rather than having to cook down fresh fruit. It only took about 20 minutes to make the whole thing and then 10 minutes to can. I used the same flavors as jerk seasoning to give it a bit of a kick and I quite like how it turned out. You can use it as you would any ketchup but it is especially good on seafood and pork. Preheat oven to 350. Boil the noodles until soft. Drain and toss with butter in a large bowl. Set aside. In a medium bowl, whip together the mascarpone, ricotta, sour cream, 2/3 cup sugar, eggs, cognac, curacao, and allspice until smooth. Stir the mixture into the cooked noodles. Fold in citron bits. Pour into a 9 x 13 baking dish*. Sprinkle the top with cinnamon and remaining sugar. Bake for 60 minutes uncovered. Serve warm or at room temperature. *We actually made 1 8x8 and a 1 1 1/2-quart so we could take some and leave some at home for us to enjoy later. 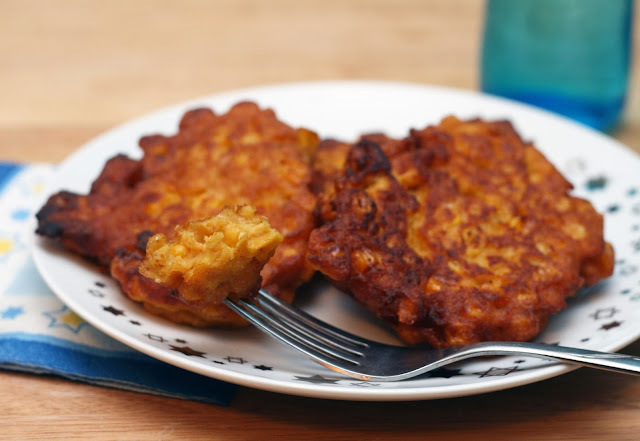 One of the best things about Hanukkah is that it lasts for 8 days so you have plenty of time to eat yummy food! We had our faux-Thanksgivukkah in October to so I could perfect my recipes to share with all of you but yesterday was actual Thanksgiving and we went to my parents' house. My mom makes most of the food but we normally bring something and this time, it was kugel in honor of Hanukkah. Let me tell you, it was so good. 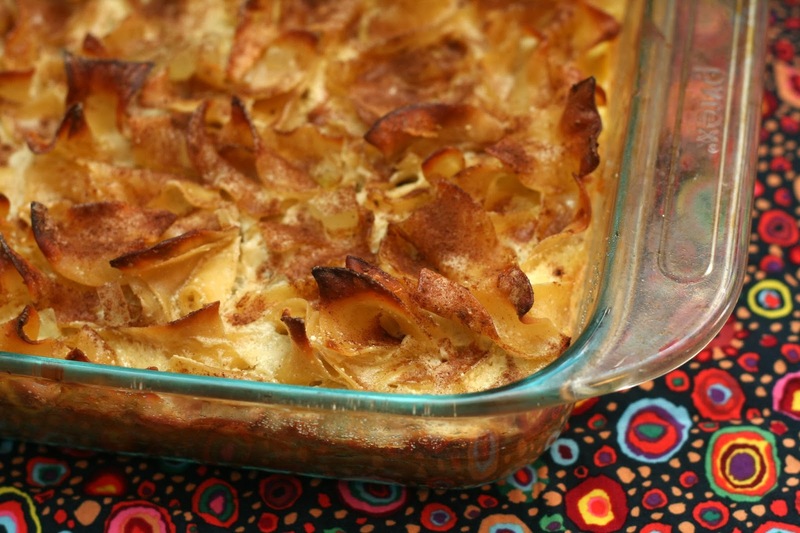 We normally are savory kugel people but this one was delicious and not crazy sweet. Matt had the idea of using Italian cheeses in it to make it extra fancy and tasty and that morphed into a sort of cannoli-inspired kugel. He bought half a citron at our local Italian store (and it was still too much, I'm so glad they were happy to halve it for us! We'd be eating a whole citron for a year) and some imported ricotta and mascarpone. Using quality ingredients really makes a difference in such a simple dish. I couldn't be happier with how it turned out; everyone loved it, even those who were new to the kugel. It was creamy without being over-the-top rich and very comforting. Remove the rounds from package, separate into 8 rounds. Place rounds on ungreased large cookie sheet. Press down center of each round to make an indentation about 1/4-1/2 inch deep. 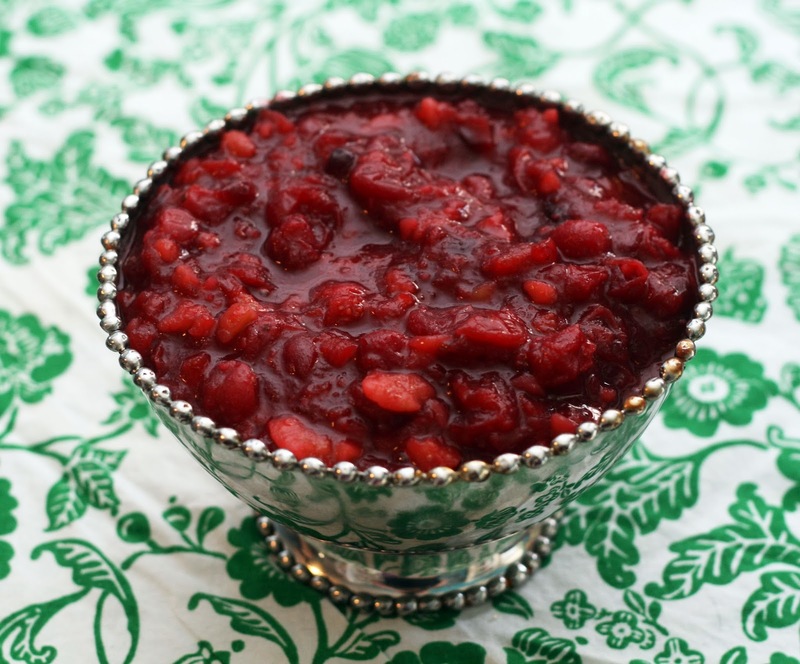 Evenly divide the cranberry sauce into each indentation, taking care not to overfill. Top each with a blue cheese crumble. Add a pecan half to each round, slightly off-center and pressing the pecan slightly into the dough. Bake for 10-12 minutes or until golden brown. Still have guests? Want to impress them and use up some leftover cranberry sauce? Do I have the recipe for you! 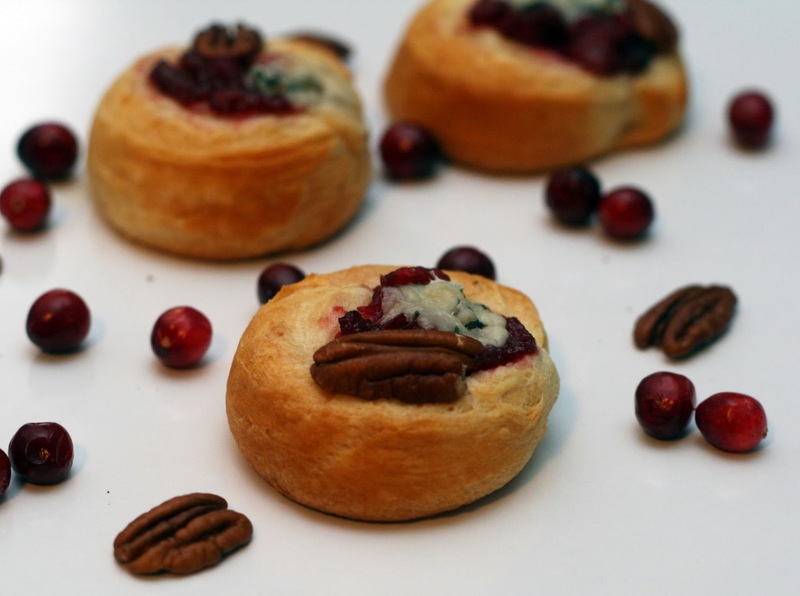 I jazzed up Pillsbury crescent rounds with leftover chestnut cranberry sauce, cheese and pecans I had leftover from another recipe to make the ultimate, easy, thrifty appetizer. 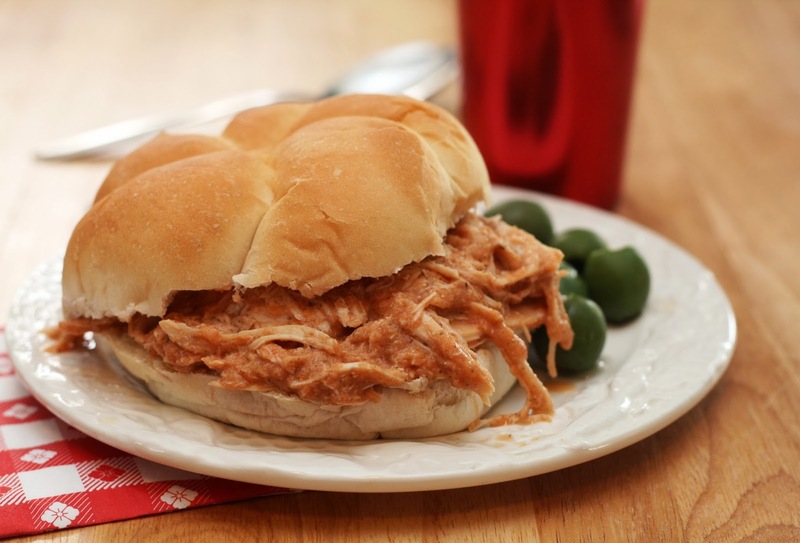 Place all ingredients in a 6 quart slow cooker. The fruit should come to the very top of the insert. Pour the mixture into a blender or use an immersion blender to puree. Cool completely and refrigerate up to 3 weeks or ladle when warm into prepared jars leaving 1/4 inch headspace and process in a hot water canner for 10 minutes. 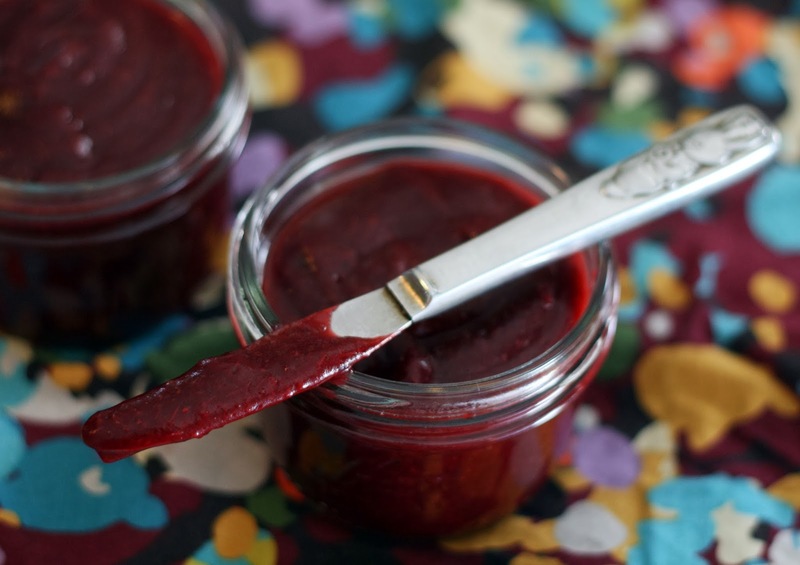 Want an alternative to cranberry sauce to spread on your turkey sandwich? Looking to get a head start on gift giving? This is the spread for you! Cranberries and crisp, juicy Asian pears are in season now and they blend perfectly in this rich fruit butter. Not only is it tasty, it is so easy to make. Just dump all of the ingredients in a slow cooker and walk away. Then scoop it into jars and water-bath process (or not) and it is ready to go. It is also the perfect way to use up those last few bags of cranberries you bought impulsively! 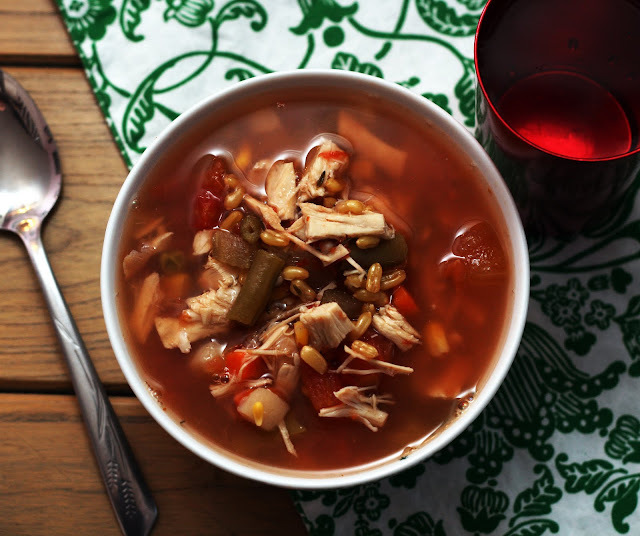 Place the frozen vegetables, garlic, tomatoes, stock, kamut, vermouth, herbs and spices in a 4 quart slow cooker. Cook on low for 8 or so hours then stir in the turkey. Cook for 1-2 hours on low then serve. *The mix I bought has carrots, potatoes, corn, green beans, Lima beans, okra, peas, celery and onion. I thought a Thanksgiving leftover recipe would be the perfect vehicle to try out new-to-me frozen soup mix vegetables. Normally when firing up the slow cooker, I chop all of the ingredients by hand the night before so they are ready to go in the morning. When picking up some frozen pearl onions (Aside: why are they often only available during the holidays? So frustrating. I end up buying a year's supply in November because I don't have the patience for peeling fresh.) I came across this "soup mix" that looked pretty good. I mean, okra? An inspired choice. I tossed them in the cart. They've been in the freezer ever since. I know I've spent enough time chopping and we're still early in the holiday season so what better time to try them out? All I had to do was chop the turkey and the garlic. The vegetables were a thrifty choice too; on sale for 2 for $1.50. I didn't price it out but that has to be cheaper than buying and chopping each of those ingredients individually, right? Which I appreciate because while I always think of soup as being this super thrifty, cheap dinner but when I actually price out the ingredients and my labor, it isn't that cheap after all. This recipe uses kamut (although I bet you could sub in farro and have great results) so you don't need an extra grain to serve. I love one pot cooking! The resulting soup was really hearty and satisfying and so flavorful! Heat oven to 375°F. Remove the rounds from package, separate into 8 rounds. Place rounds on ungreased large cookie sheet. Set aside. In a small bowl, whisk together all of the spices. Set aside. Brush each round with olive oil. Sprinkle with spice mixture. Bake for 10-12 minutes or until golden brown. Remove to a wire rack and cool completely. Long time readers know I like to do things the hard way. Once I corned beef for two weeks, made rye bread and mustard for just one sandwich. But some times, even I get burnt out. Making Faux Thanksgiving (and then all the leftovers recipes) each year is a daunting task. Every year I think about including a roll recipe (and occasionally I do) but most of the time I don't get around to it. So when Pillsbury approached me about creating a few recipes for them using one of their crescent roll products I thought I'd give it a shot. We ate crescent rolls growing up, but they were always plain with margarine (margarine! I know!). Dressed up ones seemed more appealing. I found these rounds at the store and they were pretty neat, they are already cut into 8 rounds and feature a sort of a spiral shape inside. Since I am celebrating Thanksgivukkah this year, I thought I'd tie them in with the theme (and the turkey!) 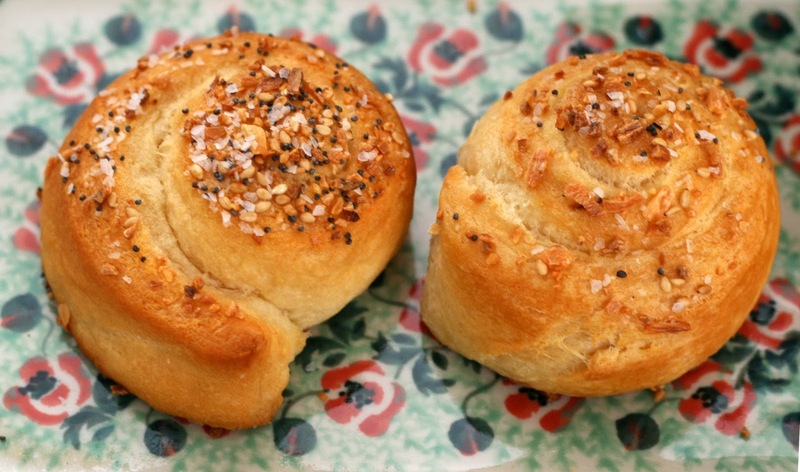 and turn them into tiny, bagel inspired rolls. Perfect for the Thanksgivukkah table. I even ate some leftover with a smear of cream cheese and some lox. Place the tomatoes, spices, sesame seeds, pumpkin seeds, Worcestershire sauce, garlic, onion and green chiles in a blender. Pulse until a smooth sauce forms. Transfer to a medium saucepan. Add the turkey. Simmer for 10 minutes or until warmed through. Serve on kaiser rolls, Italian rolls or bollitos. A popular dish at Christmas time (or Thanksgiving for many US dwelling Salvadorian families), Salvadorian turkey is a delicious treat but a lot of work. First you slather the turkey in a mixture of spices and mustard and allow it marinate for hours. Then, you simmer it in a rich sauce until it is nearly falling off the bone then the sauce is drained, simmered again until it reduces then drizzled over the turkey again. The leftovers are often served as sandwiches the next day. I've always wanted to make a Salvadorian style turkey, Pavo Salvadoreño, at Thanksgiving but a more traditional roasted turkey normally wins out. Last year I got to thinking that there was no reason I couldn't transform my leftover roasted turkey into Panes con Pavo. I decided to make a sauce that used the same flavors and ingredients and simmer the cooked turkey in it rather than starting from raw turkey. Great idea, right? However, I got so caught up making other Thanksgiving leftover recipes (they are some of my favorites to create each year!) that I ran out of turkey before I got to make the sandwiches. I saved my notes and figured I'd get around it eventually. Then just a few weeks ago Old El Paso® got in touch with me looking for a new fun way to use up leftover Thanksgiving turkey; I had turkey leftover from Faux Thanksgiving so the stars finally aligned. Turkey sandwiches for all! I used their green chiles in the sauce and they added a peppery flavor but not a ton of heat, which was perfect because Pavo Salvadoreño is not a super spicy dish. I enjoyed my sandwich plain, but traditional toppings include sliced radishes, shredded cabbage or lettuce, tomato slices and watercress. In a large pan, saute celery and mushrooms in olive oil over very low heat until the celery is soft translucent. Do not brown. Meanwhile, fry the onion in onion in a large saucepan until blackened. Cool slightly. Add to bread in the bowl and add the spices, chestnuts and herbs. Combine with egg and stock. Form medium-sized balls. Refrigerate until ready to use, up to overnight. Place balls in the bottom of the roasting pan under the rack and around the turkey on the rack for the last 1/2 hour of roasting and cook until cooked through. *I used the kind that comes in the resealable pouch. 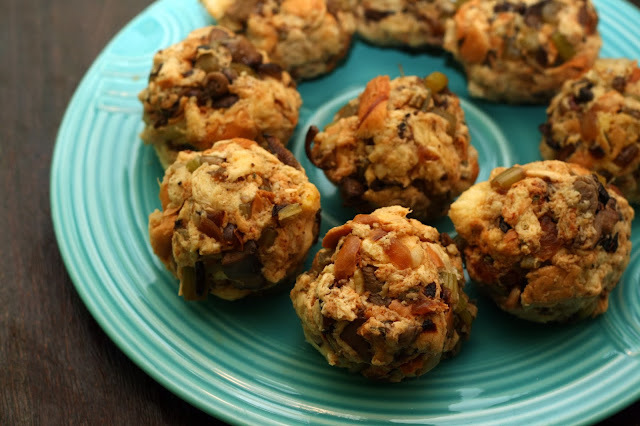 If you've been following my previous Thanksgiving posts over the years, you know I don't stuff the turkey, I don't bake the stuffing in a pan, I make stuffing balls and place them around the turkey. This gives them a bit of flavor from the turkey without worrying about stuffing the turkey and risking bacterial growth or slowing down the cooking process. When I realized we'd be celebrating Thanksgivukkah this year, I knew I'd have to make my stuffing with challah but I wasn't sure of what else should be inside. I had noticed quite a few wintery recipes using chestnuts (a surprising number; I normally associate them with Christmas) in the Jewish cookbooks I was reading in preparation for the holidays so when I came across some chestnuts at the store that were already peeled and roasted (have you ever had to deal with a raw chestnut? My advice: don't)I thought I'd incorporate them into the stuffing. I liked it a lot. Just as in the chestnut cranberry sauce, they added a rich nutty flavor without being overpowering. I browned my onions kasha style instead of leaving the soft as I normally do. That added a deep caramelized flavor. Then I added my favorite: mushrooms and the results were spectacular. One of my favorite stuffings so far. Preheat oven to 400. Loosely stuff the turkey with the onions and garlic. In a small bowl, whisk together the olive oil and spices. Rub the mixture over the turkey. Roast the turkey for 30 minutes, then turn the oven down to 325 until done, about 2 1/2 hrs. Allow to sit 5 minutes before carving. Is it too early to post this year's turkey recipe? I hope not! In keeping with the Thanksgivukkah theme, I covered my turkey in all of the seeds and spices you would normally find on the "Everything" bagel. Oh, yes, a bagel themed turkey! It really isn't as odd it sounds because basically what makes an everything bagel just that is the mixture of seeds and seasonings (rumored to be what was leftover from making other bagels, hence the everything moniker) which of course can easily top a turkey! 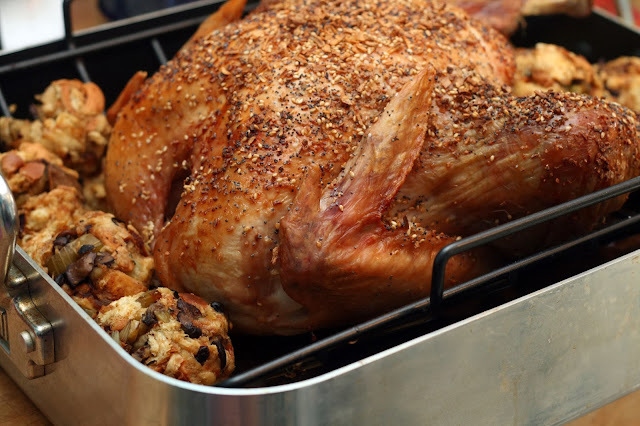 The olive oil really helps crisp up the skin and give it a lovely brown color and the seeds and seasonings really permeated the meat of the turkey. It didn't taste too bagel-y (it is meat after all!) but perfectly seasoned. And I am no food scientist the method I shared here always leaves me with a lovely turkey with browned skin, juicy breast meat and perfectly done dark. Bring all ingredients to a boil. Reduce heat then simmer until thickened, stirring occasionally. Remove from heat, remove the cinnamon stick. Serve hot or cold. What's Thanksgiving without cranberry sauce? This year I added chestnuts and was really pleased with how it turned out. Fruity yet with just a hint of chestnut. Place all ingredients in a heavy bottomed pan. Bring to a boil. Stir and reduce heat. Simmer until fully cooked, about 40 minutes. What better side dish for Thanksgivukkah than tzimmes? If you are unfamiliar it is a sort of stew that can either be meaty or vegetarian but it normally contains carrots, dried fruit (most often prunes and raisins), the occasional root vegetable and honey. 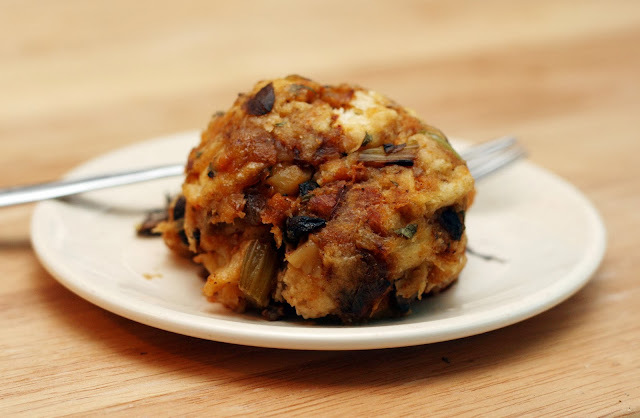 It is often served at Rosh Hashanah but it made a great side for Thanksgiving as well. 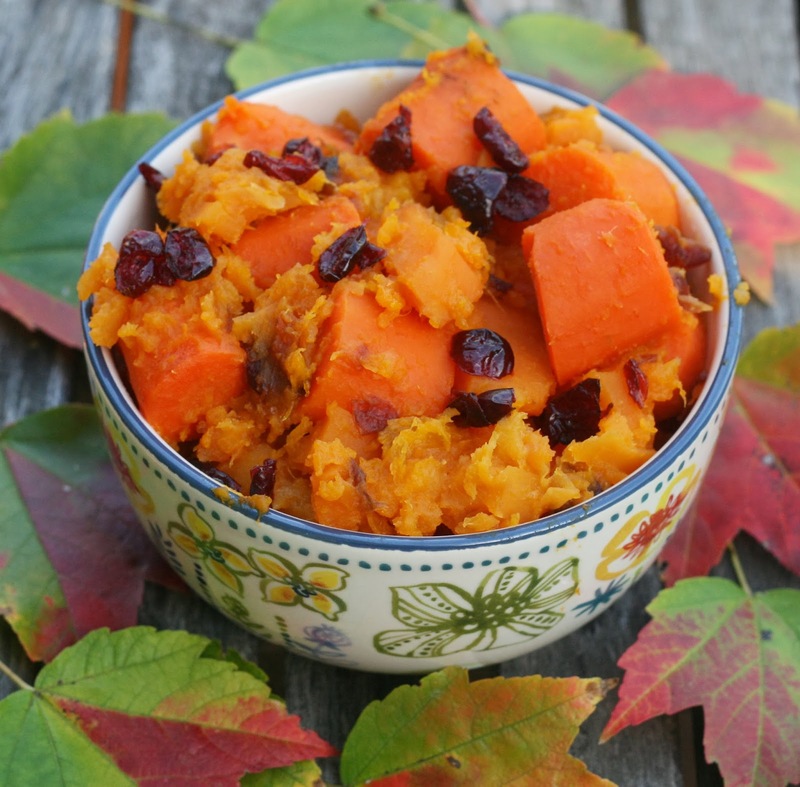 To make it more Thanksgiving-y, I added traditional Thanksgiving flavors like cranberries, butternut squash and yams. I also substituted apricots for the prunes and I think the flavors melted together nicely. Plus it was a bright, festive orange color! In a large saucepan, saute onions in oil until blackened. Beat the egg into the kasha in a small bowl. Add the kasha to pan and saute with onions until the kernels begin to separate, 5-10 minutes. Add broth cover. Simmer over low heat until kasha is tender and all of the broth is absorbed. Meanwhile, boil the potatoes until fork tender. Drain and mash the onions and kasha into the potatoes until fairly smooth. Every year I come up with a new theme for Thanksgiving. One year it was kitschy Hawaiian inspired recipes, last year it was Polish food, the years before that featured figs, pomegranate, tangerines, and apple cider. This year it was clear what the theme would have to be. Thanksgivukkah! 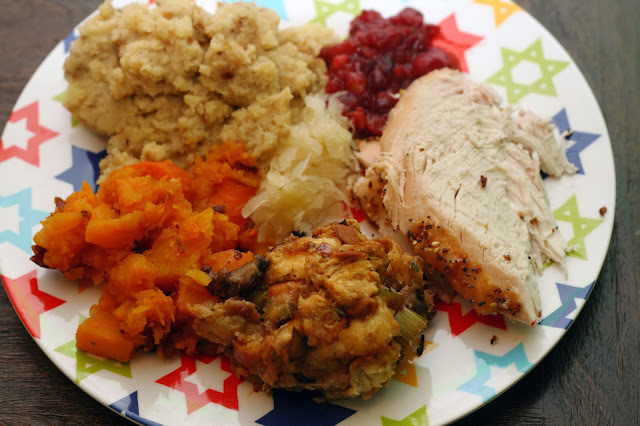 Thanksgiving and Hanukkah won't fall on the same day again for 77,798 years. The last time it happened was in 1888. The idea of combining two of my favorite food holidays was too hard to resist. 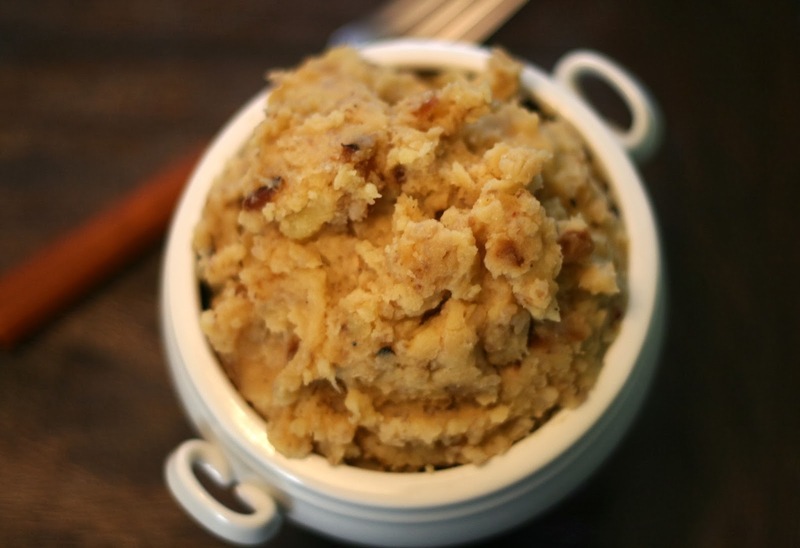 First up is knish-inspired mashed potatoes. 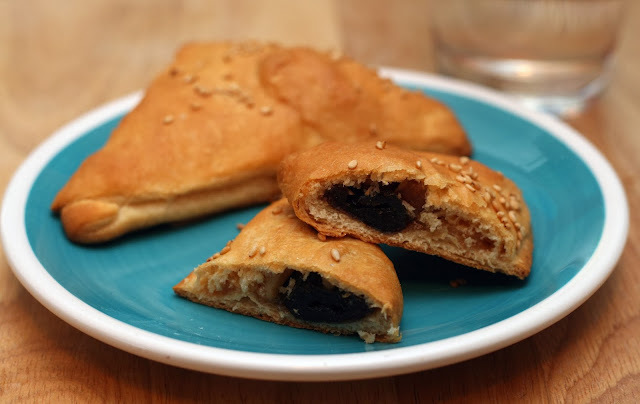 I've made knishes before, and of course had them tons of times at various delis and always enjoy them, but let's face it, the best part of a knish is the filling. This filling tastes like the perfect kasha (aka buckwheat groats; added bonus? this recipe is gluten-free) knish but without all that pesky dough. Let the lead up to Thanksgivukkah begin! 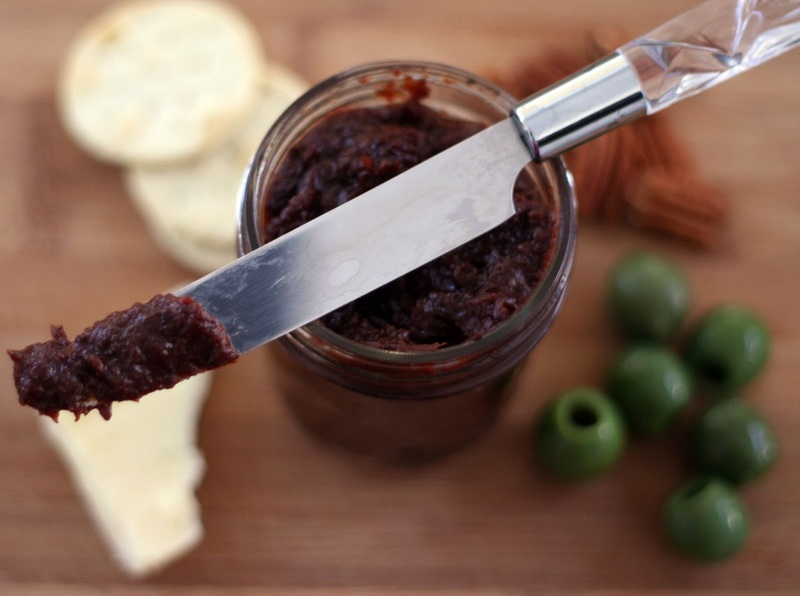 Prep your jars/lids. Place all ingredients in a heavy-bottomed nonreactive pot. Bring to a rolling boil and cook until most (if not all) the cranberries have burst and the mixture has thickened, about 20 minutes. Remove from heat. Use an immersion blender or ladle in a regular blender to pulse until smooth. Return to a rolling boil and cook until thickened to ketchup consistency if necessary. Ladle into pint jars leaving 1/4 inch headroom. Process in a hot water bath for 10 minutes. Note: if you don't want to can this (the total yield is about 3 cups of ketchup) you can refrigerate it in an air-tight container up to one month. All year I write down recipe ideas as they occur to me even if it isn't something I can make right then. Good percentage of these are Thanksgiving and Thanksgiving leftover related since I like to have an early faux Thanksgiving to test out the recipes I share with you all November. This time I was thinking of sandwich ideas and thought it would be great if there was a non-cranberry sauce type spread to use. Now I don't like tomato ketchup (it is on the list of foods I do not eat, see also: cantaloupe, pumpkin pie) but I like other kinds of ketchup. The consistency and use is the same but the flavor is far superior and much less sweet. 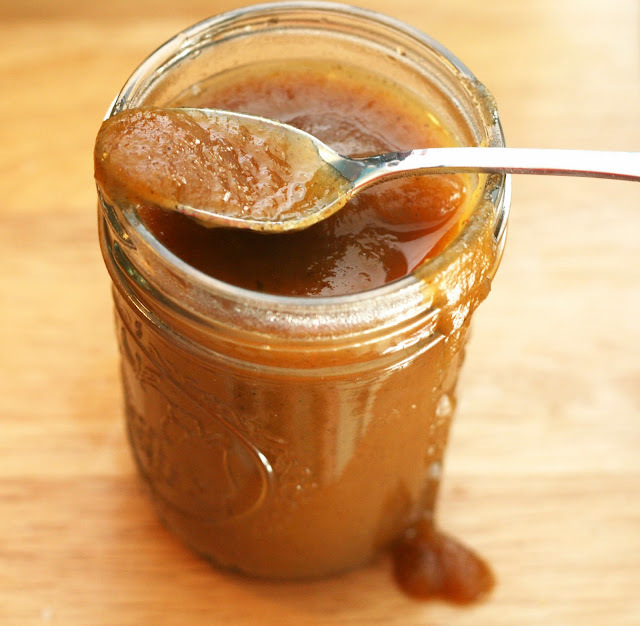 Try this one on a turkey burger or anywhere else you'd use regular ketchup. 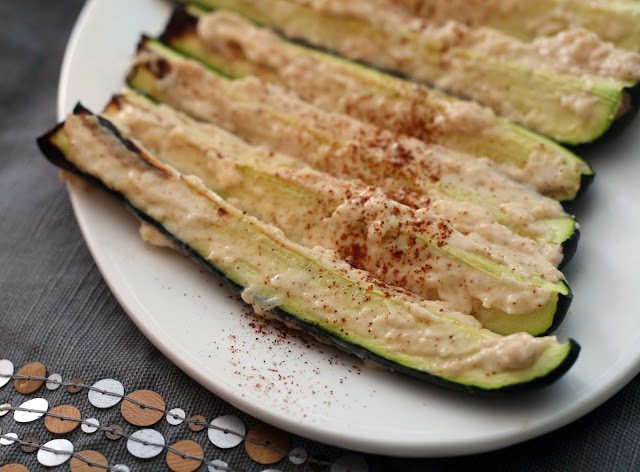 Place the zucchini wedges, skin-side down, on a baking sheet. Broil for 5 minutes or until slightly charred. Allow to cool slightly. Meanwhile, in a small bowl, stir together the mayonnaise, cream, cotija, chile powder and garlic. Spread on all sides of the zucchini. Serve immediately. Note: Can't find Mexican crema? Try sour cream thinned out with 2 tablespoons of milk. Elote is Mexican-style corn on the cob; corn slathered in mayo, cheese and spices. Sounds a little weird but it really good. Unfortunately, it is October and good corn is a distant memory. Zucchini however, is still readily available and pretty tasty so I subbed that in. It actually worked really well!My buddies at Old El Paso asked me to come up with a recipe to complement their new frozen beef burrito entree. To be honest, I'm not always the biggest frozen burrito fan (they always seem to have a frozen spot or dry out) but I really enjoyed these! They cooked evenly and quickly and were packed with meat and vegetables that were actually tasty and flavorful. The burritos only took about five minutes in my microwave so I wanted to make a side dish that was just as quick. Enter my zucchini-elote hybrid. I liked having a little extra vegetables with my burrito and the flavors did complement each other but didn't compete. It really did only take about 7 minutes to make too; perfectly timed for burrito eating.